Find the Diagrams under the + Add section. They are a selection of ready-made graphics which you can populate with your own photos, colors, symbols and text. 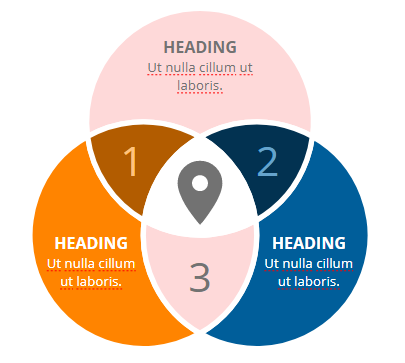 Some of the diagrams are static - you can change text, colors (don't forget you can use the ready-made color schemes too) and overall dimensions - like this venn diagram. You can change the colors, text, and replace the symbol in the center of this diagram. The diagram below lets you change colors, text, symbols and also contains 'smart' percentage rings which you can update by either dragging the ring or changing the numerical percentage value - one will update the other. Diagram with percentage rings, symbols and text.